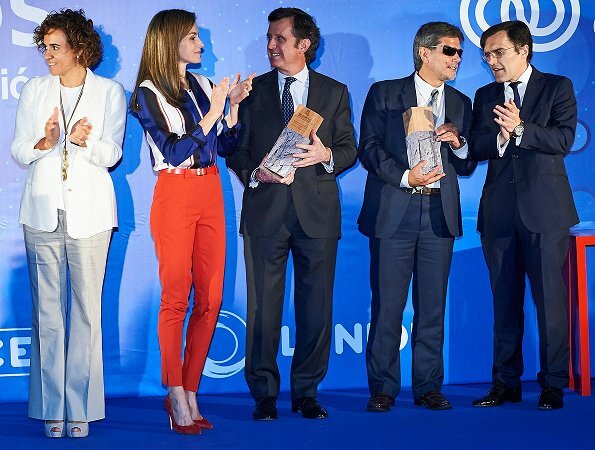 On June 26, 2017, Queen Letizia of Spain attended the Discapnet Awards ceremony at the Somontes Sport Club in Madrid, Spain. Queen Letizia wore a Stripe-Shirt from 'Binesa' collection of Hugo Boss. No. No. No. 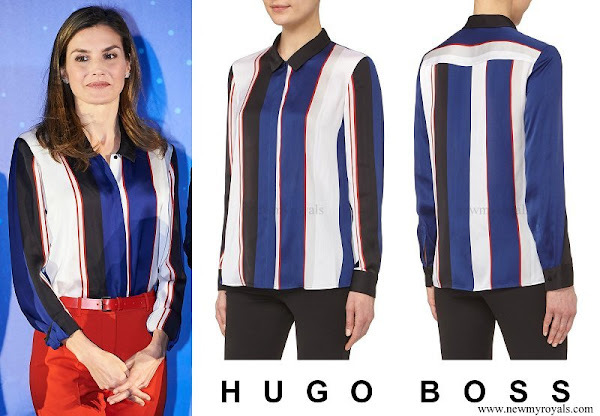 I like many of her Hugo Boss looks, but this shirt looks too masculine and even then it's ugly. Agreed, agreed, agreed. Rarely have I seen anything so ugly. I am with you, Lizzie. Not good in any way today. J'ai cru qu'elle allait jouer au foot . Cela aurait ete difficile avec des escarpins a talon quasi aiguille. One of the best outfit ever. For me it is a 10/10. Attractive, stylish, simple, chic and appropriate to the occasion. Hmm, I might have worn, white or blue slacks instead of the orange she has on. I totally agree with Silvia.The oufit is very appropiate for the event and the combination of colours and pattern very smart. Fresh but i dont know if its was apropriatte though. I don't like this - I might have preferred the shirt combined with another less startling colour of trousers, but I find the shirt brash (for want of a better word). I like the trousers, both colour and tailoring, just not in this pairing. But good for her for having fun with her fashion. I think she is dressed too casually for the Queen of Spain passing out awards. All the people standing next to her have blazers on. She should have worn one over her outfit. It would have made a world of difference. The event's most important aspect is that Discapnet is a project financed by the Fundación ONCE and by the chain of hotels ILUNION that strives to provide people with physical disabilities with means to achieve full social inclusion offering them jobs, training courses and spaces to meet and share knowledge and experiencess. 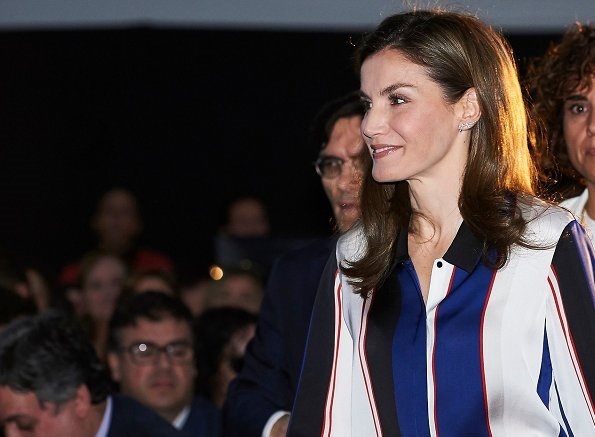 Queen Letizia couldn't fail to attend such a project's awards ceremony. She looks lovely an perfectly adequate to an event held at a sports club. I rather like the sport reference in the shirt but I would have preferred it with a skirt to make it look a bit more formal. As it is it's too "sport you". Too casual. I understand she always wants to look younger and hip, but she needs to dress a bit more her age. ¿En serio tienes entendido? Será en el vomitatis, por lo menos...¿Hay alguna mujer que se vista para parecer más vieja? One of the worst outfits I have ever seen Letizia wear. Horrid shirt and trousers, dreadful. A refined taste is needed to appreciate certain things. It is called aesthetic experience. Don't lose hope. La reina Letizia se ve estupenda. Preciosa y original camisa y bonito color de pantalón y zapatos. Is there anything that she can wear that would not be exceptional by you? Lol... nothing personal, of course. We're all entitled to opinions, but I have come to predict (ton100% success) that you will be in awe with her choices. I wish I could write in Spanish well enough to say this in an appropriate choice of words, cause the last thing I mean to do is offend anyone, so I hope it won't get lost in translation). To me this is certainly a style, agreed with you Silvia from that perspective, but for the image I have in my head of a queen-appropriate attire, this one fails on a couple of perspectives: the pants are too skinny (we already all know she has an incredible figure, it's neither necessary nor appropriate to show that off by wearing such tight-fitting clothes). Also, they look terribly wrinkled at the knees and overall she looks slightly unkempt. Angie looks at Letizia with rose colored glasses. In her view she can never do anything wrong. It's very amusing reading her comments. She looks like taking part to sport competition. No from me.